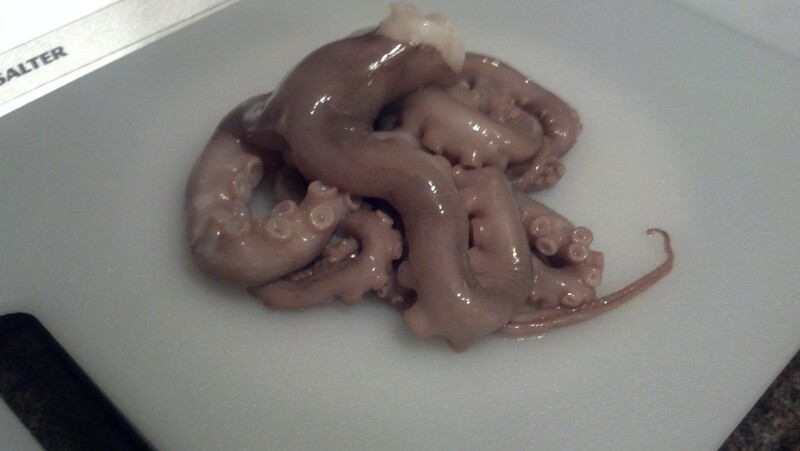 I was roaming the isles of Koreana Market picking up a few things for my kitchen when I saw fresh wild Octopus. Its rare to see fresh octopus in a market here in Oakland so I had to pick it up. They were a great size, between 150 grams and 170 grams. Octopus is huge in the Portuguese cuisine, stewed, fried, grilled and pretty much anyway we can cook it. I grabbed 3 of them to work with at the house , some fresh garlic, soy and tomatoes. I planned on doing a simple braise that reminded me of my childhood. The soy i use was obviously a twist on the original since we don’t use much soy in the islands of Portugal. 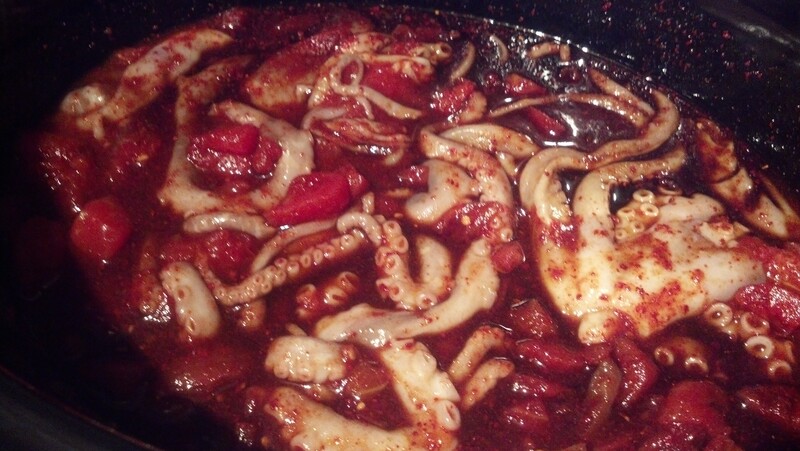 I find many people are intimidated by cooking octopus and squid but its easier then it seems. People have failed for so long at cooking cephalopod because they don’t understand the science behind it. You’ve probably cooked squid or eaten out and it was tough, chewy and pretty much like a rubber band. So here is the science behind why its tough. The tentacle consists of a thick central nerve cord (which must be thick to allow each sucker to be controlled independently) surrounded by circular and radial muscles. Because the volume of the tentacle remains constant, contracting the circular muscles decreases the radius and permits the rapid increase in length. Typically a 70% lengthening is achieved by decreasing the width by 23%. The shorter arms lack this capability. Ok so what that says basically is cephalopods have a very tight muscle structure, much tighter then any other species we consume. When heated up the proteins begin to constrict and tighten making them tough. A few different ways to go about making it tender. Another way to tenderize is an Italian style, you blanch the Octopus 3 times at 45 seconds to 1 min each time then braising slowly for an amount of time depending on the size. And the way I go about cooking mine. I start with a large pot that can hold roughly 1 gallon of water per 1 lbs of octopus, 1 cup of red wine, small handful of salt, black pepper to taste, and some herbs such as thyme. I allow the octopus to simmer in this mixture for 45 mins to 1 hour. 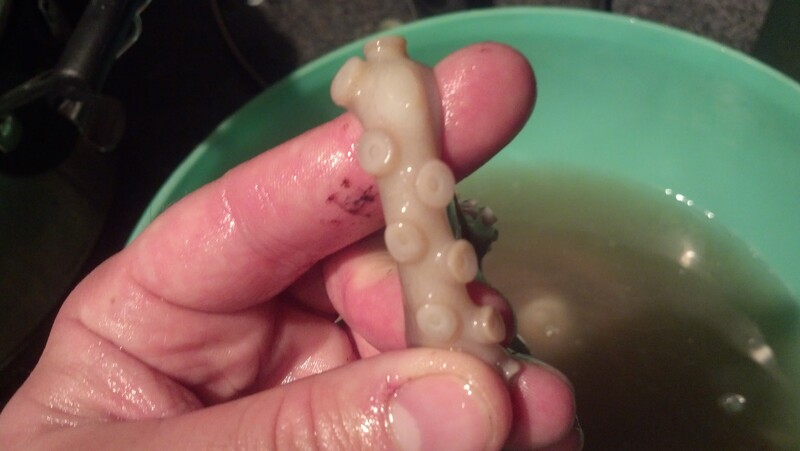 This will give you a soft Octopus with a little bite. 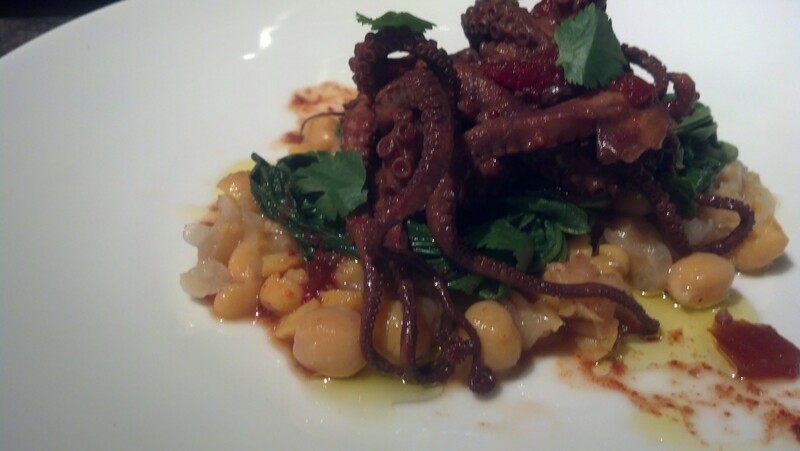 Now back to my original thought of braising Octopus at my house. Place all the ingredients into my slow cooker making sure the octopus is fully submerged in the liquid. I turned the slow cooker to low which on my model is roughly 160 degrees and cooked it for 45 mins. Let the liquid cool to room temperature. 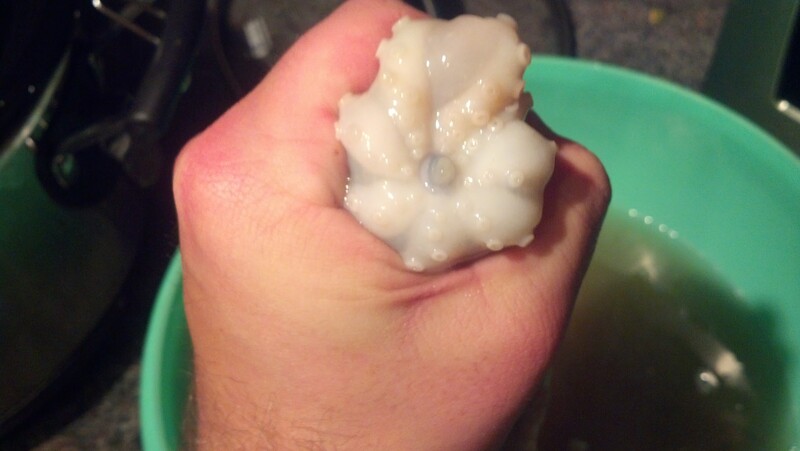 Once the liquid was room temp I pulled the octopus out and patted dry with a paper towel. Take all the liquid out of the slow cooker and place into a large pot, at a low temperature a reduce by 2/3. Great explanation! I always appreciate the science behind the method.